If you are in the market for a horse, a good place to start horse shopping is through personal contacts. Maybe you know a horse owner, or are currently taking horse lessons from an instructor. Ask these people if they know of any horses for sale. Through their inner-circle of horse friends, vets, farriers, feed stores, tack shops, and so on, they might know of where a good horse is for sale. They can also give you some pointers on the type of horse that may be best for you. If you are new to horses, then one of the best ways to ensure you'll find a good match is to utilize the help of a horse trainer or riding instructor. They are often well connected and can help you save a lot of time and money. You will generally pay these professionals a commission of between 15 and 20 percent. These professionals can assess the horse as well as your riding ability. Collaborating with a broker is also a good idea when horse shopping. A "horse trader" can scout out potential horses saving you a lot of time, and provide you with expert opinion on the horse's problems or potential. When enlisting a horse trader, find out if the broker will take back a horse if you find out it is not suitable for you. The best way to find a good broker or trainer is through word of mouth. Also, most breed associations, such as The American Quarter Horse Association, have a referral service for professional trainers and brokers. And don't be afraid to ask for references when choosing a professional. Feed stores, tack shops and veterinarian clinics often have bulletin boards or keep binders with horses for sale. Keep in mind these ads are often outdated. Newspapers and horse periodicals or trader magazines are a good source for finding horses. However, with the Internet often providing cheaper horse classified ads, sellers will often post an online ad before paying for a more expensive printed ad. Internet horse classifieds will generally allow you to do a narrowed search when horse shopping by using criteria such as location, price, breed, etc. so you can quickly narrow your search. Some Internet classifieds even offer email notification if an ad is posted that meets your criteria. Internet ads generally provide more detail and better pictures. One downside of Internet ads is there are quite a few sites who provide this service, so unless you happen to be searching on the same site a seller has posted on, you may not find the horse for you. Horse trader publications generally have a larger selection of horses and are more detailed than those in the local newspaper ads; however, they may not be local and you will have to manually search through potentially hundreds of ads. Local newspaper ads do not provide enough space for adequately describing the horse and do not generally show pictures, so you will have to make a lot of phone calls and visits. If you know what breed of horse you want, and if you're fortunate enough to have a breeder for that type of horse in your area, you will want to visit their stables. 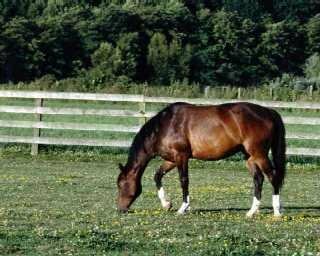 You will pay a little more for a horse from a breeder, but it is generally worth it as these horses are well bred and kept in top condition since this is the breeder's livelihood. It is best not to buy a horse from a livestock auction. Though they can be bought very cheaply, horses being sold at these auctions are generally there because they are not suitable for private sale to anyone for any number of reasons. A "select auction" on the other hand is a good place to go. The horses have been well taken care of, the owners are there for you to talk to, and you have an opportunity to ride the horses.